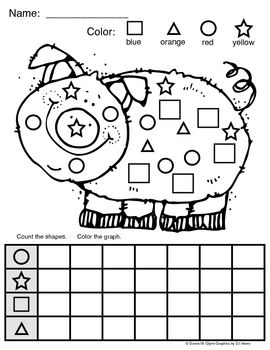 Here is a great activity called Piggy Shape Graph. This activity was created to help students in Preschool, Kindergarten, First, and Second grade count and graph data on shapes. What a great way to have students apply several skills at once. It combines basic skills of shape identification with counting skills and knowledge of graphing data. Teachers can use this activity as a large group mini-lesson, teacher-led guided group lesson, or a skills review activity. Click on the link to visit the teachers pay teachers site to download this freebie!